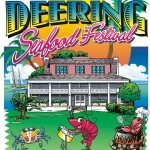 Enjoy the 6th Annual Deering Seafood Festival at Deering Estate at Cutler. Get swept away in the magical sights and sounds of the Caribbean with the rockin’ rhythms of the Bay Roots Reggae Band, Symphony of Steel, the free-spirited fanciful moves of the Bahamian Junkanoo, scrumptious seafood, cooking demos by local celebrity chefs, art exhibits, the Li’l Shrimp Kids Zone, pontoon boat rides, tours of the historical Deering Estate and more. Bring your family and friends and plan to spend the day! Today from 11:00 – 6:00 Click link above for more information. This entry was posted on Sunday, March 28th, 2010 at 2:07 pm	and is filed under 365 Things To Do In Miami. You can follow any responses to this entry through the RSS 2.0 feed. Both comments and pings are currently closed.